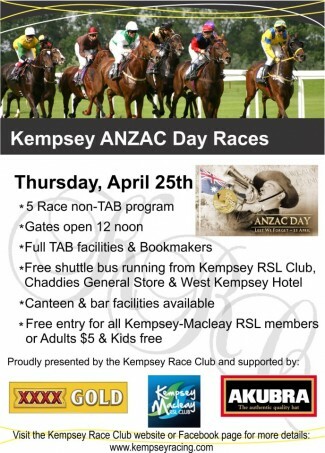 Kempsey Racing - Anzac Day races are back! >> Home > News > Anzac Day races are back! A huge family day is planned with free jumping castle for the kids, free shuttle bus service from town CBD to racetrack & a 5 race non-TAB meeting. Feature race will be the Kempsey-Macleay RSL Diggers Cup over 1900m. Gates open at 12 noon and entry is free for any RSL members, so why not be trackside with your family this Anzac Day!